We have just marked anniversaries of the war crimes and crimes against humanity committed by the US government against the people of Japan and Vietnam. Seventy years ago, on August 6, 1945, the US military unleashed an atomic bomb on Hiroshima, killing at least 140,000 people. 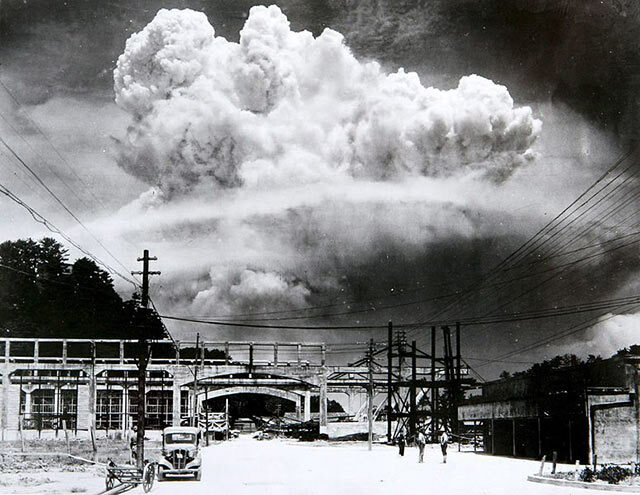 Three days later, the United States dropped a second bomb, on Nagasaki, which killed 70,000. And 54 years ago, on August 10, 1961, the US military began spraying Agent Orange in Vietnam. It contained the deadly chemical dioxin, which has poisoned an estimated 3 million people throughout that country. On the day of the first atomic bombing, 19-year-old Shinji Mikamo was on the roof of his house in Hiroshima helping his father prepare it for demolition when he saw a huge fireball coming at him. Then he heard a deafening explosion and felt a searing pain throughout his body. He said he felt as if boiling water had been poured over him. Shinji was three-quarters of a mile from the epicenter of the bomb. His chest and right arm were totally burned. Pieces of his flesh fell from his body like ragged clothing. The pain was unbearable. Shinji survived but most of his family perished. Shinji’s daughter, Dr. Akiko Mikamo, told her father’s story at the Veterans for Peace convention in San Diego on August 7. She wrote the book, Rising From the Ashes: A True Story of Survival and Forgiveness From Hiroshima. Akiko’s mother Miyoko, who was indoors about a half-mile from the epicenter, was also severely injured in the bombing, but she too survived. Southard notes that the US government censored Japanese news reports, photographs, testimonies and scientific research about the condition of the survivors. Thirty years after the end of World War II, numerous cases of leukemia, stomach cancer and colon cancer were documented. The bombings of Hiroshima and Nagasaki were criminal because at the time Japan was already defeated and had taken steps to surrender. With these atomic bombings, the United States launched the Cold War, marking the beginning of its nuclear threat. Sixteen years after the United States’ nuclear attacks on Japan, the US military began spraying Vietnam with Agent Orange-dioxin. In addition to the more than 3 million Vietnamese people killed during the Vietnam War, an equivalent number of people suffer serious diseases and children continue to be born with defects from Agent Orange. US veterans of the Vietnam War and their children suffer as well. Agent Orange caused direct damage to those exposed to dioxin, including cancers, skin disorders, liver damage, pulmonary and heart diseases, defects to reproductive capacity and nervous disorders. It resulted in indirect damage to the children of those exposed to dioxin, including severe physical deformities, mental and physical disabilities, diseases and shortened life spans. Dan Shea joined the US Marine Corps in 1968 at the age of 19. He served in Vietnam a little more than two months. But he was in Quang Tri, one of the areas where much of the Agent Orange was sprayed. When Shea saw barrels “all over” with orange stripes on them, he had no idea the dioxin they contained would change his life forever. When they ran out of water, he and his fellow Marines would drink out of the river. In 1977, Shea’s son Casey was born with congenital heart disease and a cleft palate. Before his third birthday, Casey underwent heart surgery for the hole in his heart. Ten hours after surgery, Casey went into a coma and died seven weeks later. Just as the US censored information about the effects of radiation after the atomic bombings, the US government and the chemical companies that manufactured Agent Orange – including Dow and Monsanto – also suppressed the 1965 Bionetics study that demonstrated dioxin caused many birth defects in experimental animals. The spraying of Agent Orange finally stopped when that study was made public. Shea, who also addressed the Veterans for Peace convention, works with me on the Vietnam Agent Orange Relief and Responsibility Campaign. We seek to obtain relief for the Vietnamese, Vietnamese-American and US victims of Agent Orange through the recently introduced H.R. 2114. US vets have received some compensation, but not nearly enough. Vietnamese people and Vietnamese-Americans have received nothing for their suffering. This bill would assist with the cleanup of dioxin still present in Vietnam. It would also provide assistance to the public health system in Vietnam directed at the 3 million Vietnamese people affected by Agent Orange. It would extend assistance to the affected children of male US veterans who suffer the same set of birth defects covered for the children of female veterans. It would also lead to research on the extent of Agent Orange-related diseases in the Vietnamese-American community, and provide them with assistance. Finally, it would lead to laboratory and epidemiological research on the effects of Agent Orange. The US government has also denied that Agent Orange is present on Okinawa, the Pentagon’s main support base during the Vietnam War. In February 2013, the Pentagon issued a report denying that there is Agent Orange on Okinawa, but it did not order environmental tests or interview veterans who claimed exposure to Agent Orange there. “The usage of Agent Orange and military defoliants in Okinawa is one of the best kept secrets of the Cold War,” according to Jon Mitchell, a journalist based in Tokyo. Two hundred and fifty US service members are claiming damages from exposure to Agent Orange on Okinawa during the Vietnam War, but very few have received compensation from their government. In spite of the Pentagon report, the US Department of Veterans Affairs granted relief in October 2013 to a retired Marine Corps driver who has prostate cancer. The judge ruled that his cancer was triggered by his transport and use of Agent Orange. Besides being criminal, the United States’ use of nuclear weapons in Hiroshima and Nagasaki, and poisoning of Vietnam and Okinawa with Agent Orange, are a shameful legacy. The denial and cover-up of each of these crimes adds insult to injury. As we work toward a nuclear deal with Iran, the US government should abide by its commitment to nuclear disarmament in the Nuclear Non-Proliferation Treaty. It is also time to fully compensate the victims of Agent Orange and fund a total cleanup of the areas in Vietnam that remain contaminated by the toxic chemical. Urge your congressional representative to cosponsor H.R. 2114, the Victims of Agent Orange Relief Act of 2015. Finally, we must hold our leaders accountable for their crimes in Japan and Vietnam, and ensure that such atrocities never happen again. Marjorie Cohn is a professor at Thomas Jefferson School, former president of the National Lawyers Guild, and deputy secretary general of the International Association of Democratic Lawyers. A co-coordinator of the Vietnam Agent Orange Relief and Responsibility Campaign, she is on the national advisory board of Veterans for Peace. Her latest book is Drones and Targeted Killing: Legal, Moral, and Geopolitical Issues. Photo Atomic cloud over Nagasaki from Koyagi-jima, August 9, 1945 by Hiromichi Matsuda.